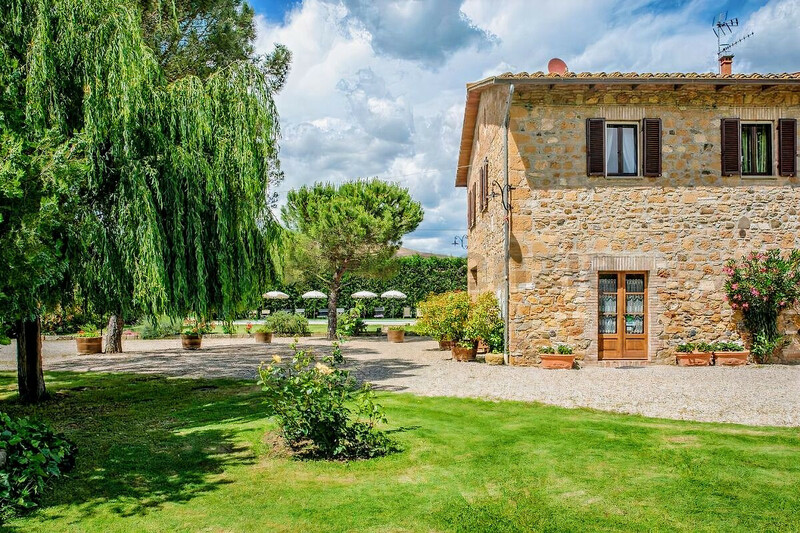 The typical Tuscan stone villa has recently been renovated and restored with great attention to details without changing the original atmosphere. 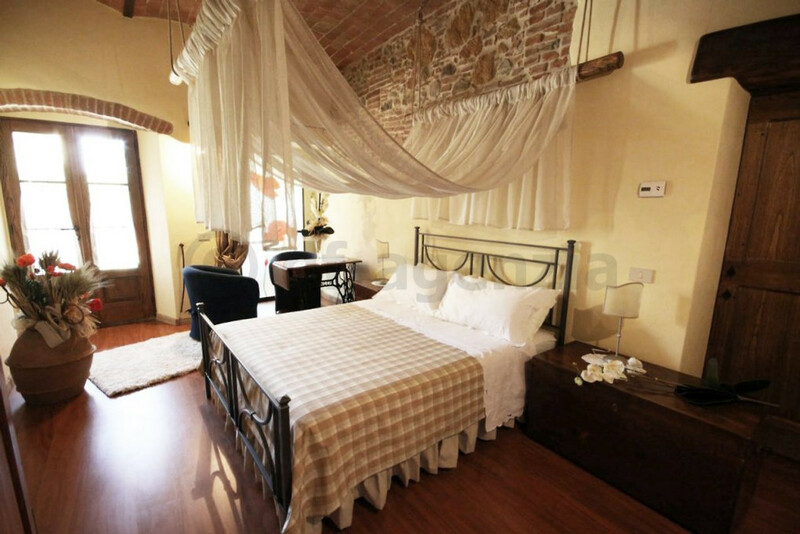 All rooms are tastefully furnished and show a stately rustic ambience. 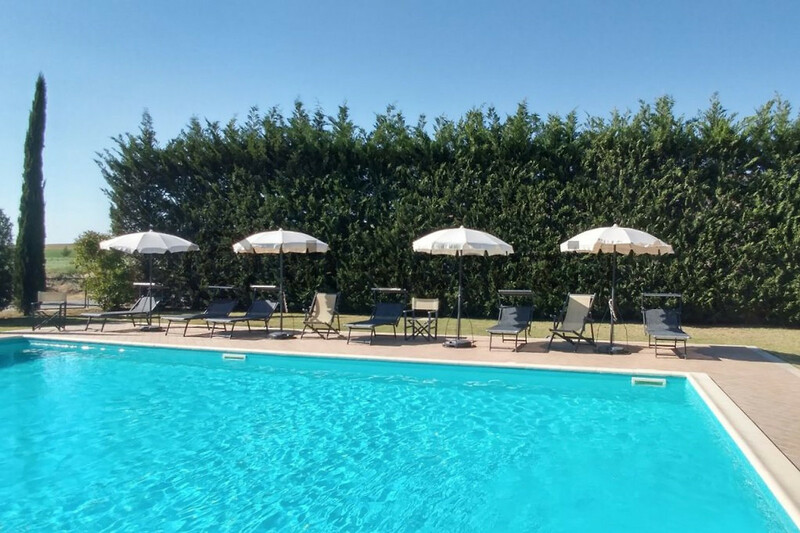 There is a completely independent farmhouse with private half of landscaped garden exclusively at your disposal, which also houses the elegant pool facility. 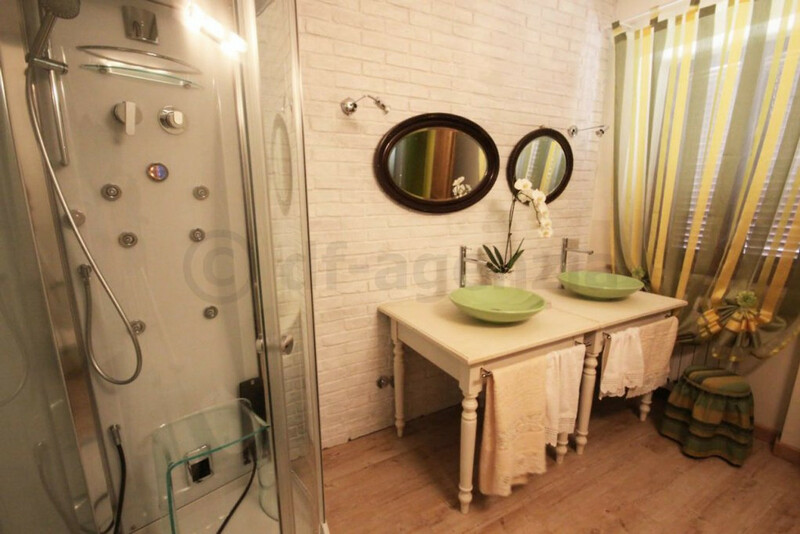 The privacy of the guests is preserved, because the possession can't be looked into. The country villa offers space for a maximum of 10 people in 4 bedrooms, all with en suite bathrooms (all with shower), 2 additional beds can be delivered. An external staircase leads to the upper floor. 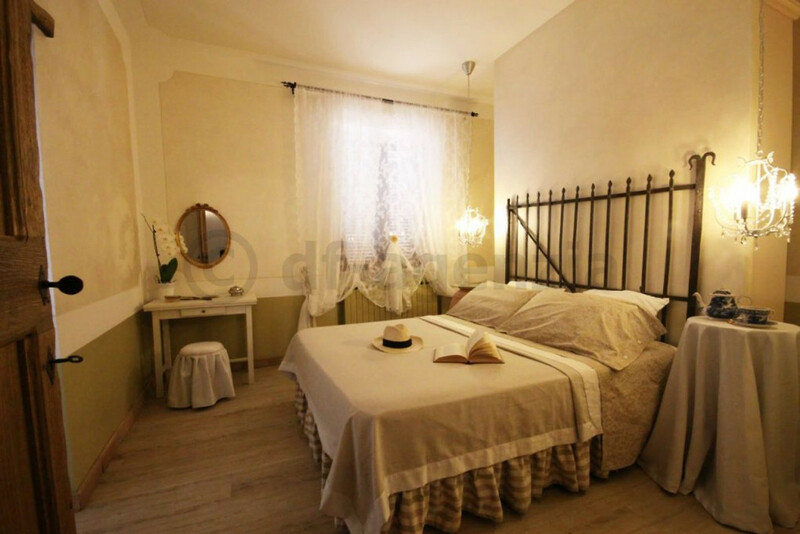 Here you find a library with a cozy sofa, comfortable armchairs and a fireplace, where you can relax and recover, as well as three further double bedrooms with en suite bathrooms, one of which equipped with a power shower. 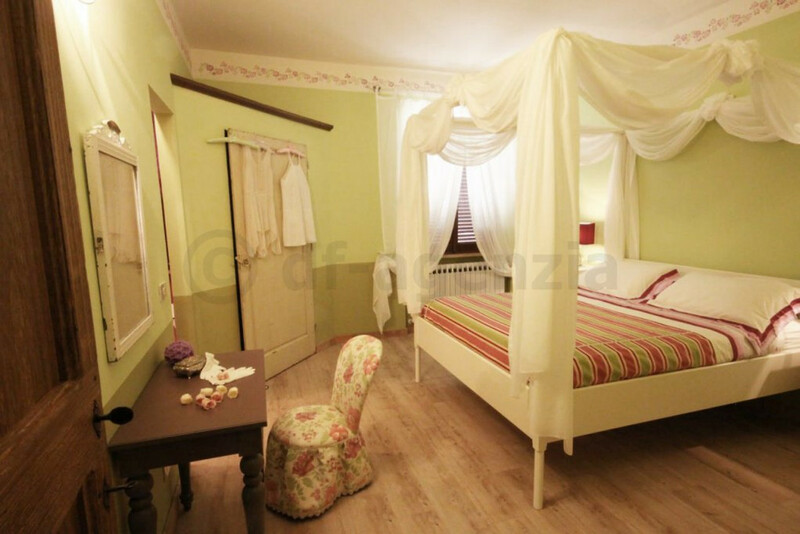 Two extra beds can be placed either in the bedroom or in the reading room. 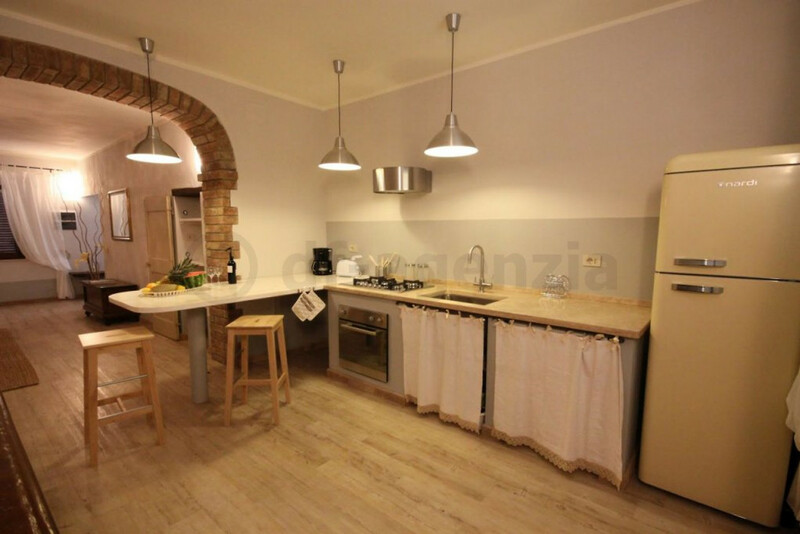 On the ground floor there is a double room with bathroom and a comfortable kitchen with a small breakfast bar. 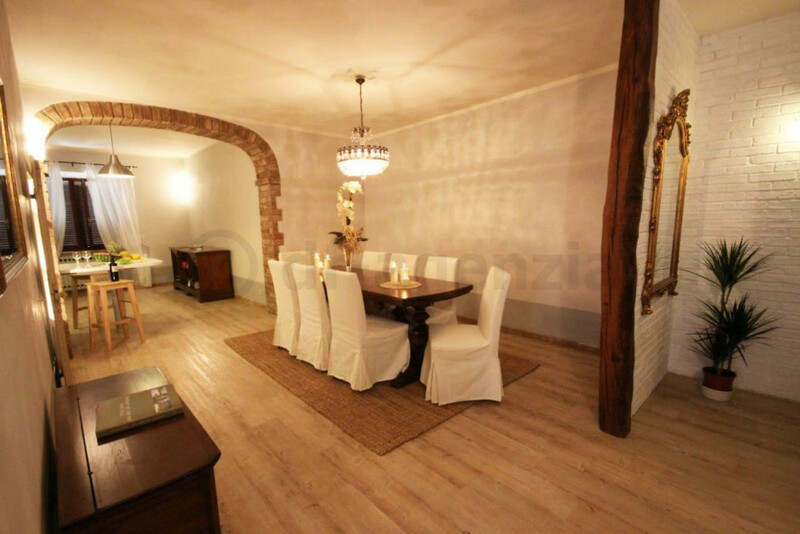 In the adjoining dining room there is space for all guests round the big table. 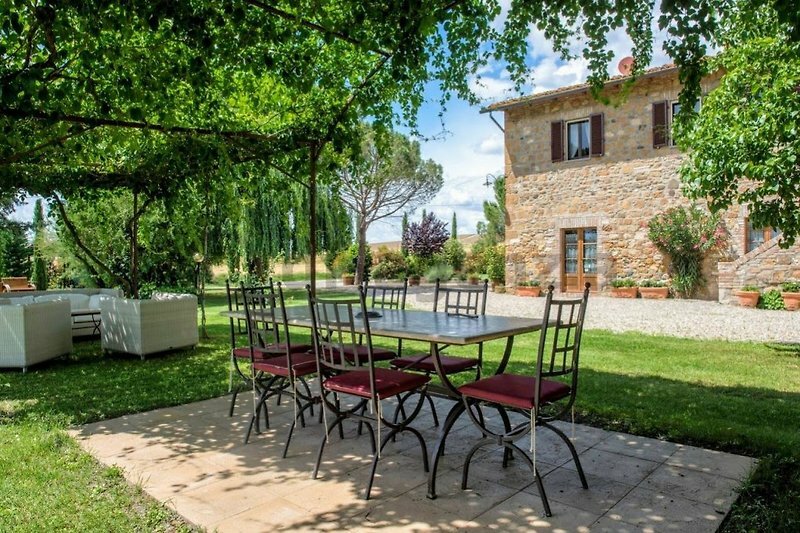 Outside the house in the 500 m² garden with well-kept lawn are shaded seatings under the pergola for outdoor dining, play equipment such as swings and see-saw for the children and the pool area (6 x 12m, to m deep) with comfortable deck chairs and parasols. 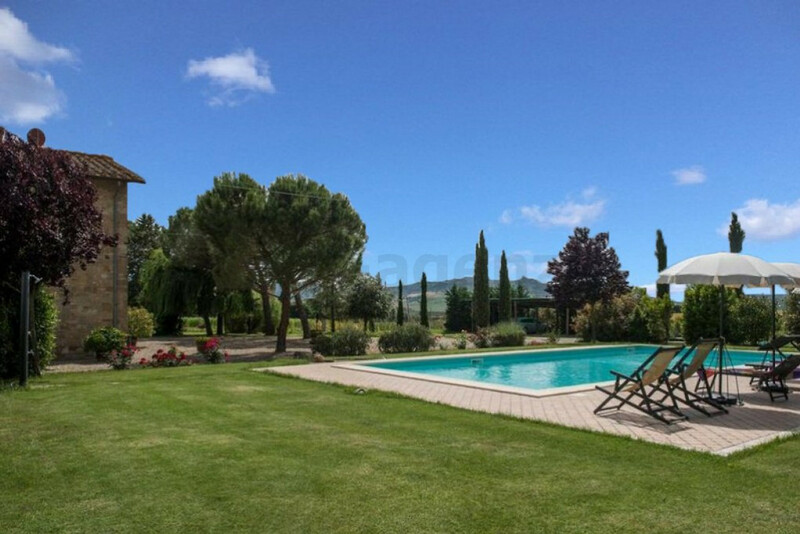 The property offers sufficient car-parks for the guests. 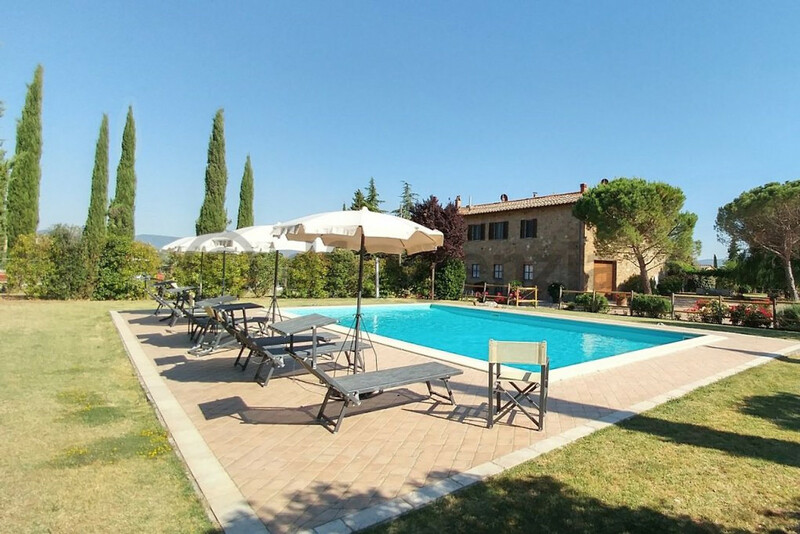 The nearest village Bagno Vignoni is in only 4 km's distance, restaurant and bus station can be found 4 km away, to the nearest grocery store you get in a ride of 10 km. The area offers a variety of different sports facilities, horseback riding and tennis are just a small selection of possibilities. 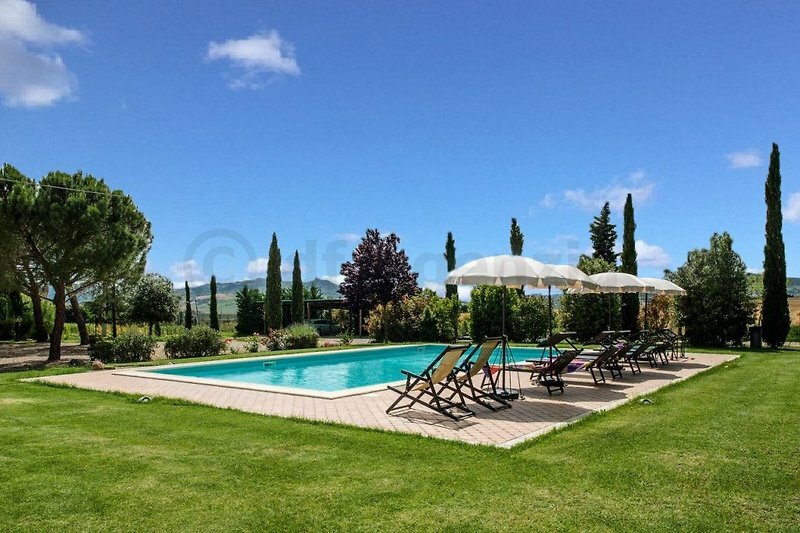 The house is situated in a panoramic position at 250 meters above sea level on a hill in the heart of the Val d'Orcia in the province of Siena and belongs to the municipality of Pienza. 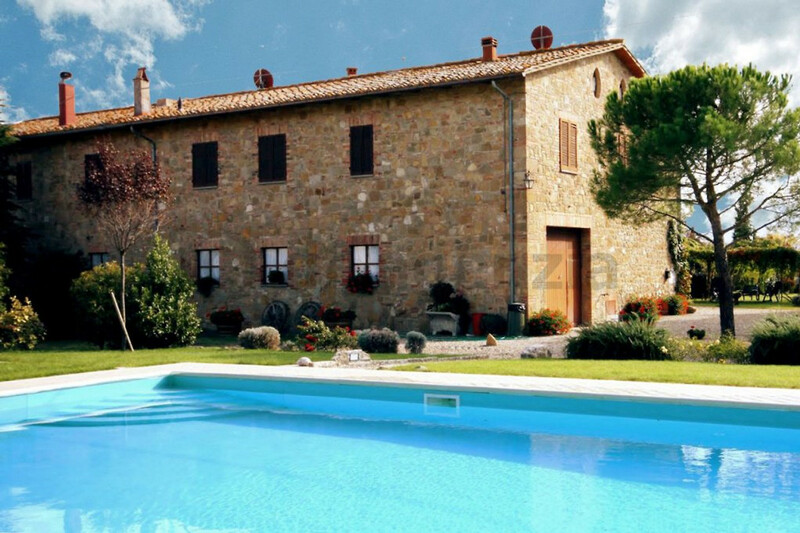 It is surrounded by olive groves and a vineyard, with views to the castle Spedaletto from the17th century. 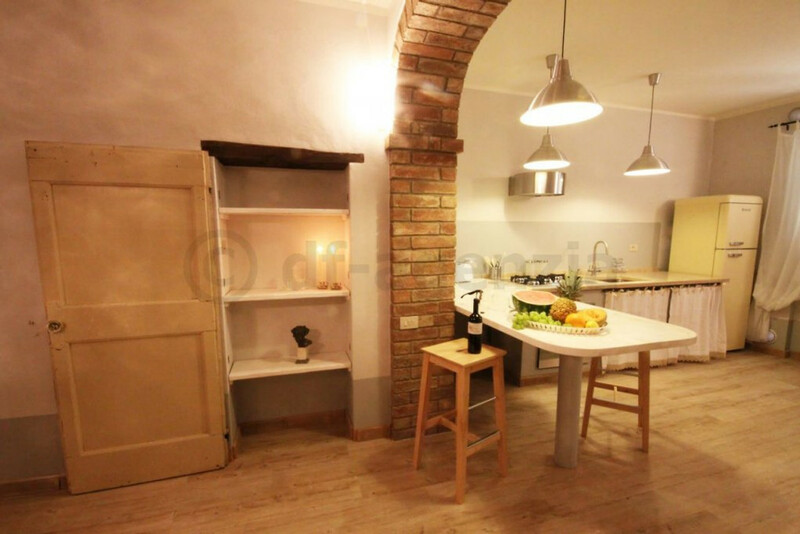 Its central location makes it the ideal base for exploring the cultural treasures of the area such as Florence, Siena, Perugia, Cortona, Pienza, Montalcino, Arezzo, Grosseto etc. 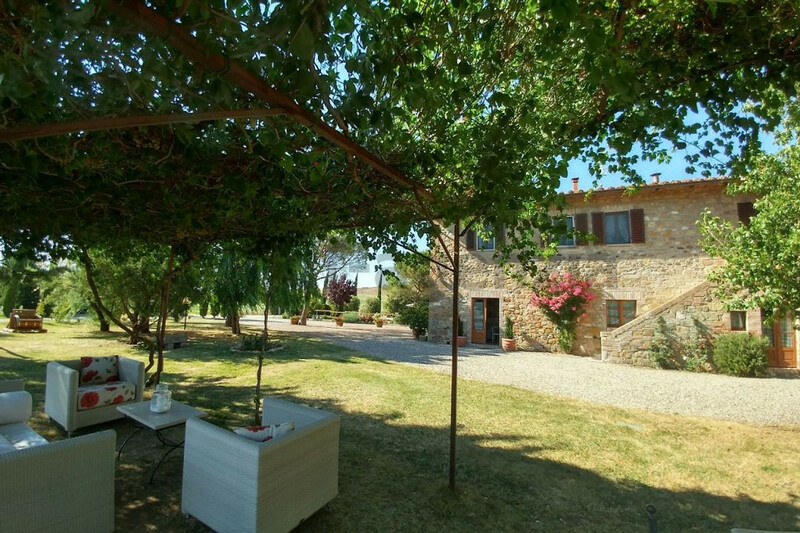 In addition, numerous dirt roads run around the villa, ideal for long walks or hikes. 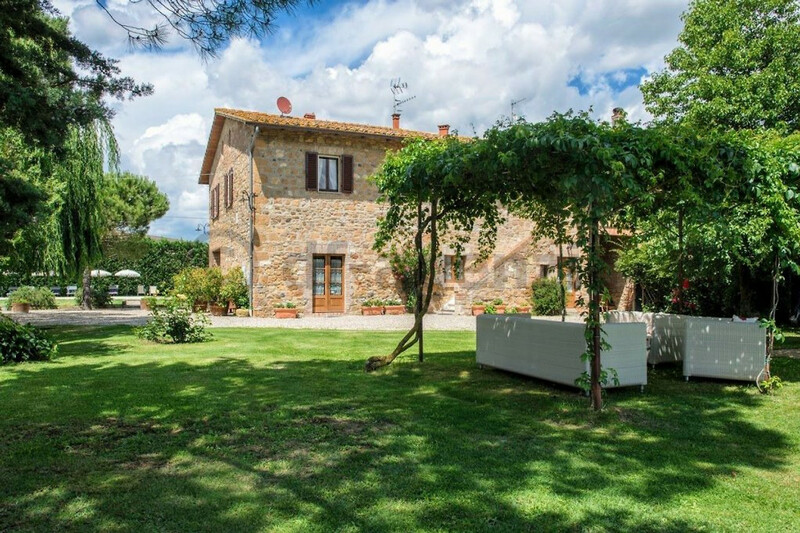 Only a few kilometers away there are tennis courts, a riding school and the hot springs of Bagno Vignoni. 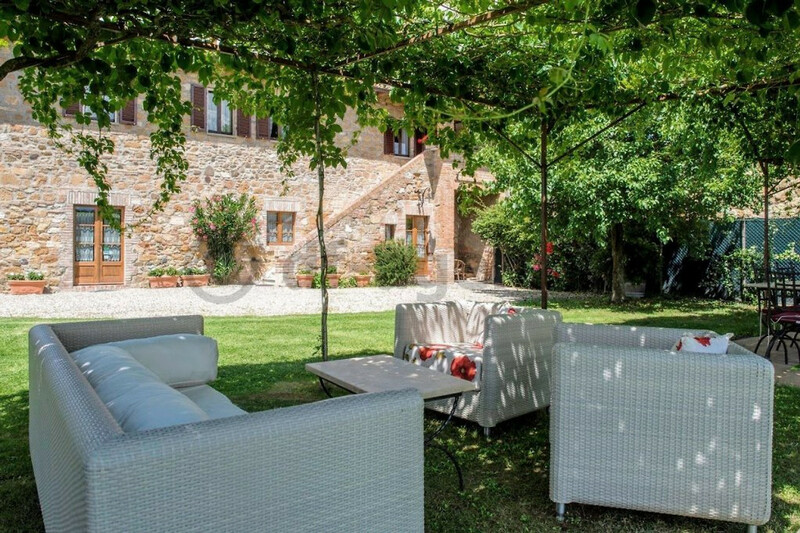 The nearby Lake Trasimeno offers additional pleasant refreshment. 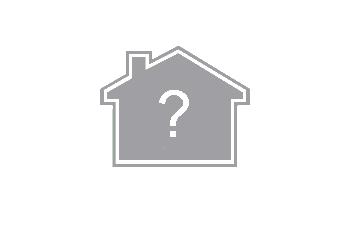 The access to the property can be passed comfortably by any kind of vehicle. Well suitable for small parties or family celebrations. Wir waren das erste Mal in diesem Teil der Toskana und haben zwei Wochen gebucht. Gereist sind wir mit einer befreundeten Familie, somit waren wir 4 Erwachsene und 4 Kinder. Schon bei der Ankunft haben wir uns in das Anwesen verliebt. Die Lage ist perfekt für Ausflüge nach z.B. Pienza, Montalcino, Montepulcano, Siena etc. Auch das nächstgelegene San Quirico d'Orcia ist einen Besuch wert. Das Ferienhaus wurde mit sehr viel Liebe zum Detail wunderschön eingerichtet. Die Bilder entsprechen zu 100% dem was man vor Ort vorfindet. Ein großes Dankeschön gilt insbesondere der Eigentümerin Vanessa und Ihrer Familie. Wir wurden mit großer Herzlichkeit empfangen und Vanessa war jederzeit für uns erreichbar. Great stay, very nice house. Wir waren das erste Mal in diesem Teil der Toskana und haben zwei Wochen gebucht. Gereist sind wir mit einer befreundeten Familie, somit waren wir 4 Erwachsene und 4 Kinder. Schon bei der Ankunft haben wir uns in das Anwesen verliebt. Die Lage ist perfekt für Ausflüge nach z.B. Pienza, Montalcino, Montepulcano, Siena etc. Auch das nächstgelegene San Quirico d'Orcia ist einen Besuch wert. Das Ferienhaus wurde mit sehr viel Liebe zum Detail wunderschön eingerichtet. Die Bilder entsprechen zu 100% dem was man vor Ort vorfindet. Ein großes Dankeschön gilt insbesondere der Eigentümerin Vanessa und Ihrer Familie. Wir wurden mit großer Herzlichkeit empfangen und Vanessa war jederzeit für uns erreichbar. Wir werden bestimmt wieder kommen.